Victoza prescriptions are currently not available via our online consultation service. You can, however, request an online consultation for weight loss. What is Victoza used for? When not to use Victoza? Victoza is unavailable at the pharmacies working together with Dokteronline.com. You can find an alternative treatment with the same active ingredient here. Please follow this link to find other medicines to treat obesity. 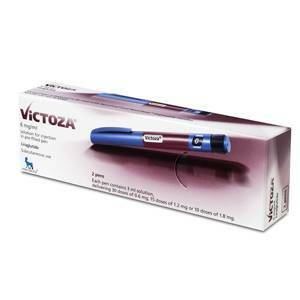 Victoza prefilled injection pens contain the active ingredient liraglutide. Victoza has been approved for treating people with type 2 diabetes. Clinical trials have shown that Victoza is also effective as an obesity treatment, so it may also be prescribed off-label to help overweight or obese patients to lose weight. Note: You can only order Victoza via Dokteronline.com for the treatment of excess weight and obesity. If you would like to order Victoza for type 2 diabetes, please see your own doctor. Victoza was originally developed for the treatment of type 2 diabetes. During the clinical trials it was discovered that, aside from drastic reductions in blood sugar levels, almost all of the test subjects also lost weight. Being overweight is measured by a body mass index or BMI. BMI is calculated by dividing weight in kg by height in m2. A person with a BMI higher than 25 is considered overweight, whereas a person with a BMI higher than 30 is considered obese. This page is for ordering Victoza for weight loss purposes, not for type 2 diabetes. Victoza can be used to support weight loss in individuals with a BMI of 28 or higher. The active ingredient liraglutide reduces the rate at which food passes from the stomach into the intestines, which causes a feeling of fullness that reduces further food intake. When used in combination with sufficient exercise, it can contribute to weight loss. Victoza should not be used if you have a personal or family history of thyroid cancer, and in children under the age of 18. Victoza is not recommended for people with inflammatory bowel disease (IBD), diabetic gastroparesis and type 1 or 2 diabetes. Victoza subcutaneous injections are self-administered under the skin. The best injection site is the front of the thigh, abdomen or upper arm. This instruction video provides step-by-step guidance on how to administer the injection. Victoza injections should be administered once a day at the same time each day, regardless of meal times. Victoza pens should be stored in a refrigerator. Make sure the containers do not directly touch the freezer compartment. The pens expire one month after opening. Caution: Victoza injections are not suitable for use as a weight loss treatment in people suffering from type 1 or 2 diabetes. Victoza injections should be administered once a day, regardless of meal times. It is better to use the injections at the same time each day. Like all medicines, Victoza may cause side effects. Nausea and diarrhoea are common side effects, especially in the initial phase of treatment. This is usually only temporary and will disappear once the body adjusts to the medicine. Low blood glucose level (hypoglycaemia) may also occur. Talk to the doctor about how to deal with this. For a full list of side effects, see the package leaflet. The package leaflet also provides information on possible contraindications, warnings and other side effects.